Seven months after GBV's seminal Alien Lanes hit shelves, Matador Records released this 6 song follow-up EP. 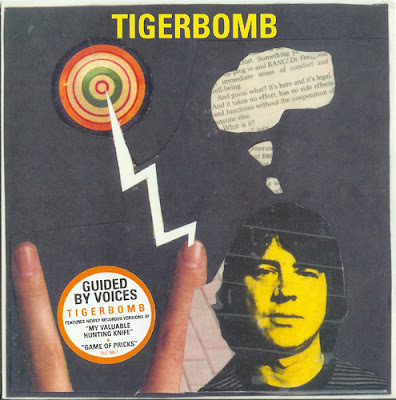 Equal parts radio promotion and exclusive track EP, Tigerbomb is a worthy throw-back to two essential Alien Lanes tracks. The 7'' contains two hi-fi, yet somehow also scrappy, re-recordings of Alien Lanes classics. The following 4 tracks are all new for the picking. Tobin Sprout closes this one out with the sweet pop-hammer down. Yup, that's a saying now! ALSO, this EP marks the first appearance of future GBV full-time guitarist, and Cobra Verde member Doug Gillard. Gillard co-wrote, and provides guitar on "Mice Feel Nice (In My Room)." My Valuable Hunting Knife (7’’ version)- 5 Radio friendly version of the same song off Alien Lanes. Slightly longer and much more dynamic with the full band, the full drum kit does wonders for the song. Still great. Game of Pricks (7’’ version)- 5 Still a perfect song, hi-fi or not. Again, pretty radio friendly. I often go back and forth with which versions better. Alien Lanes has the scrappy charm, and intimate crackle. But this one gives you a powerful kick. Both are fantastic. Mice Feel Nice (In My Room)- 2 Maniacal melodic bellowing over rainy day feel piano. Trippy and harsh in a harrowing way. Sounds like White Album outtakes. Not Good for the Mechanism- 1 Pulsating bass guitar distortion akin to Vampire on Titus ruckus. Pollard yelling nonsense over what sounds like no particular set pattern. Kiss Only the Important Ones- 4 Comforting acoustic song with intimate feedback squeals in the background. What could have been a simple tossed off idea became a song we’re privileged to get to hear. Dodging Invisible Rays- 5 One of Sprout’s best. Easy to digest, incredibly hooky ‘60s pop jangled gem. Undeniable and unavoidably hooky chorus.